In early September I received an email newsletter from Vicki Robin, author of Blessing the Hands That Feed Us. It gave notice of the 10-Day Local Food Challenge that would begin in October. It sounded interesting and I was glad she was doing that, but I was over my head in work and barely had time to read the email, let alone act on it. I was away from home from September 12-23 and two more newsletters about the challenge arrived in my inbox during that time. I’m back now—at least until October 24 when I leave for the Mother Earth News Fair in Topeka, Kansas—and I am beginning to get caught up. Thinking the local food challenge would make a good topic for my blog, I took the time to look into it. The guidelines of this challenge are to select 10 days in October 2014 when you will eat only food sourced within 100 miles or so from your home. You are allowed 10 exotics, which are foods not found in that target area. You can do it by yourself or get others to join you. You can make a formal commitment to this project by taking an online survey and joining the Facebook Group for the project. Or, you can only make a personal commitment if you don’t want to be public about it. That’s okay, but one of the reasons for this project is to gather information about our local food systems and come up with ideas about how to make them better. The survey results and the comments from the online community will help toward that end. If it turns out that you can’t fulfill your plan to do this, that’s okay, too. No one will come knocking at your door asking to see what is on your plate. It is an opportunity to learn more about what you eat and where it comes from. Maybe you can’t do it for the whole 10 days–so do it for 5 days–or 1 day. If you aren’t ready to make a commitment, but want to stay informed about the project, you can sign up through the website for that, too. 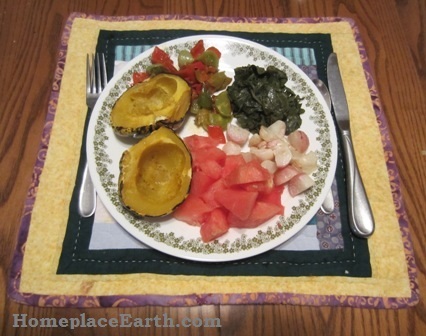 Dinner for Day 1-acorn squash, sauteed peppers and green tomatoes, kale, roasted radishes, watermelon. The emails began arriving in early September to give participants an opportunity to begin preparing, but I was too busy to pay attention. With no preparation at all, I decided to jump into this and began my 10 days on Sunday, October 5. I say no preparation, but in reality I’ve been preparing for something like this for a long time. I have experienced my Homegrown Fridays when, during the Fridays in Lent, I only consumed what I had grown myself. No exotics allowed. This seems much easier than that. Sure, I have to stick to it for 10 days straight, but I have so many more options. On top of that, I have the luxury of 10 exotics! Our dinner on October 5 included acorn squash, kale, and roasted radishes from Peacemeal Farm, homegrown peppers and green tomatoes sauteed in bacon grease that was saved another day when I cooked bacon from Keenbell Farm, and watermelon that I found hiding in the weeds when I cleaned up the garden. I made some cornbread that day from the recipe in The Resilient Gardener by Carol Deppe. The salt, butter, and baking powder that were required are on my list of exotics. The cornmeal and eggs were grown right here by me. This recipe requires no wheat. I already have jam made from local and homegrown fruit sweetened with homegrown honey. Besides being an interesting challenge (and promising to be easier than Homegrown Fridays) I was also attracted to this challenge because I used to assign my students at J. Sargeant Reynolds Community College a project to contemplate what it would be like if the trucks stopped coming to the grocery stores. I told them at the start of the semester in late August that this would happen on January 1 and they needed to plan now to source their food for the next year from within 100 miles. We had many good discussions over that 100 Mile Food Plan project. They received extra credit if they marked circles on a highway map showing 25, 50, 75, and 100 miles from their home. 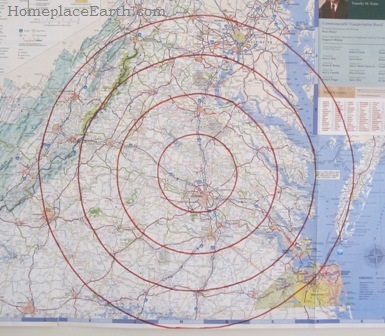 Actually, just that act of putting the circles on the map was a real eye-opener for most. They began seeing all the possibilities, rather than limitations. If you don’t know where the sources are in your area for local food you can begin your search with www.localharvest.org. Another attraction to the 10-Day Challenge is to put into practice what I wrote about in Grow a Sustainable Diet. In this book I show you how to plan a diet around homegrown and local foods, while at the same time planning to grow cover crops that will feed the soil. When your food comes from sources other than your garden, take the time to question the farmers who grew it about their soil building practices. It is great to do as much as we can for ourselves, but we don’t have to do everything ourselves. It is in joining with others in our communities that we gain strength and resilience for whatever the future holds. I hope I have encouraged you to join the 10-Day Local Food Challenge. If you have been following my work and thought that Homegrown Fridays might be a bit too much to do, give this a try. To my former students, now is the time to update that plan you made years ago and act on it. To the current JSRCC sustainable agriculture students, this seems made to order for you. Put your plan into action! If circumstances prevent you from actually doing this now, at least begin to think about it. You could plan one meal, maybe with friends, with all the ingredients being homegrown or sourced locally. To those who have read my book, taking this 10-Day Local Food Challenge is an opportunity to reinforce what you have learned and expand your thinking. When you take the survey to join, there will be space to write additional information. Please take that opportunity to say that Cindy Conner sent you. That way they can track how people learned about he challenge. Best wishes to all who join this adventure! Cindy, I saw your talk at the MEN fair. I haven’t joined any specific challenge but this year has been our best year ever for eating our own homegrown produce. A favorite brunch for my husband and I over the last couple of months has been to sauté a diced zucchini until tender, add a diced tomato just long enough for it to cook, then pour a half dozen scrambled eggs (from our chickens) over it and cook just until the egg is set. Delicious as is or we sometimes sprinkle salt, pepper or other herbs and spices over it for variety. This week I dehydrated about 50 jalapeño peppers to make my own jalapeño powder so in the future we will even have our own spices to put on our meals! We raise our own lamb, chicken, turkey and duck meat so do have meat options and also just purchased a ¼ beef from a grass-fed cow raised by an acquaintance not far from here. Between our meat, eggs and veggie garden, I have barely grocery shopped in the past six months, relying on the store now only for milk, coffee and bread. This challenge is very doable! Yes, it is doable! I’m glad you have such a good start on a local homegrown diet. Also glad that you could make my talk at the MEN Fair!